One of the benefits of attending our Technology Services World Conference is the ability to spend a day in a professional development course, doing a deep-dive on a subject critical to your organization’s success in 2012. Our Spring TSW event will be held at the Santa Clara convention center May 7th-9th, with the professional development courses taking place on May 7th from 8am to 1pm on the 2nd floor of the rotunda. For a complete overview of the courses being offered, follow this link to Monday’s schedule. I’m very pleased to bring you an interview with one of the professional development course instructors, longtime TSIA partner, Tim Matanovich of Value and Pricing Partners. John: Thanks for agreeing to share your wisdom and expertise with TSIA members at your upcoming professional development course from 8am-1pm on May 7th at the opening of our Technology Services World conference. Can you give my readers an overview of the course? Tim: The course is titled Profitable Technology Services Pricing, and will give participants skills and tools to drive more profitable growth. I focus on profitability because price is arguably the most powerful driver of business profitability. In addition, a focus on pricing contributes to closer customer relationships, more effective sales people, breakthrough service strategies and less competitive intensity. John: Could you talk a bit about how the course is structured? How will attendees spend their day? Tim: My advice is: Don’t show up unless you want to be engaged. We start by listing the pricing issues that brought participants to the course, and then keep coming back to them as they relate to the material. The program is built around the four components of our pricing system: Pricing Objectives, Pricing Strategy, Pricing Execution and Pricing Infrastructure. This is very much a workshop. During the last hour, participants will be given a copy of our Pricing Impact Model, and we will be quantifying the impact of a pricing change on their businesses to demonstrate the power of price in driving financial results. John: TSIA continues to expand our membership, now offering research and conference content across technical support, professional services, field service and education services. What departments and titles do you see as the target for your professional development course? Any positions you would like to see paying more attention to this topic? Tim: Many service organizations don’t have pricing specific job titles. Pricing is a marriage of marketing and finance (Some would say a marriage made in hell). A person who attends will often be responsible for margins or profitability. In addition, price is one of the three legs of marketing strategy, so someone responsible for services strategy or marketing would be a good fit. Finally, price can be a powerful weapon in the arsenal of executives. John: What are some of the common challenges you run into when working with companies on services pricing? Do you see companies struggling with similar problems? Tim: Sure, there are several common challenges we see. Number one is that services organizations don’t do a very good job of measuring price performance, and so they can’t manage what they don’t see. Second is widespread use of cost based pricing. Cost based pricing leads to weak margins, stressed sales people and unhappy customers. Third is monopriceosis, aka, one price fits all. Monopriceosis leads to both lost margins and lost sales. Each of these is an anchor to more profitable growth. John: What are some of the key trends you see making services pricing a critical topic for service professionals? Why should companies focus more on this area? John: Tim, thank you so much for taking the time to speak with me today, and good luck on your professional development course! Tim: My pleasure John. See you at TSW! I was lucky to get a pre-brief of one of the most exciting new company launches I’ve seen for some time, Social Dynamx. Based in Austin, with leadership whose background includes executive roles at Siebel/OracleCRM and Sigma Dynamics (one of the best offer management platforms ever invented, acquired by Oracle in 2006), this company has built a social customer service platform designed for large enterprises. The company officially launched this week! Here’s a link to the press release. Role-Based User Interface. Role-specific UIs designed for agents, supervisors and managers, giving each the features and access levels they need for their individual responsibilities. Automated Prioritization and Matching. Social Dynamx’s proprietary algorithms score posts for relevancy and actionability. Then posts are matched in real time and auto-assigned to the most appropriate skill group. Agents can quickly identify and respond to high-priority issues first and fast. 100% cloud based. The platform’s open architecture means it’s easy to integrate with your existing investments in CRM, knowledge management, social listeners, peer-to-peer support communities and business intelligence systems. Advanced Conversation Management. Go beyond posts and start having conversations. Social Dynamx supports advanced conversation management so agents can respond, thread, split, de-dupe and unify conversations so customers receive the attention they deserve and expect. SLA-Based Metrics. Stop treating social media interactions lack second class conversations. Social Dynamx delivers comprehensive real-time metrics across agent and workgroups so managers and supervisors have immediate insight into KPIs. Use out-of-the-box metrics, or export and build your owns. Enterprise-Grade Workflow. TSIA members are very process oriented, and I was thrilled to see that the platform delivers customized workflows so you can assign, re-prioritize, flush, re-assign, audit and report on every post and conversation. Congratulations to Social Dynamx on the launch! The company is already engaged with multiple TSIA members, and I look forward to sharing customer case study examples as they emerge. For those of you attending Technology Services World, I’m pleased to announce that Social Dynamx will be participating in our Service Revolutions showcase on May 9th, in which the audience watches live demos of bleeding-edge tools for service and votes for their favorite. I’m looking forward to everyone seeing Social Dynamx in action! Christmas comes early: Lessons Unlearned has arrived! Yesterday I had an opportunity to do something few people ever have the opportunity to do, and you only get to do it once in your life: I opened a big cardboard box to lay my hands on the hard cover edition of my first book, Lessons Unlearned. After 18 months of writing, editing, rewriting, reviewing and editing, and rewriting some more, then the endless tedious reviews and tweaks for layout, to finally hold the actual book in my hands was incredibly rewarding. I was down in our corporate HQ in San Diego for internal meetings, and there were boxes of books everywhere in preparation for the official book launch at Technology Services World on May 7th. I signed a few hundred books to be sent to press, industry gurus and partners, and while my penmanship may leave a lot to be desired, I loved it. 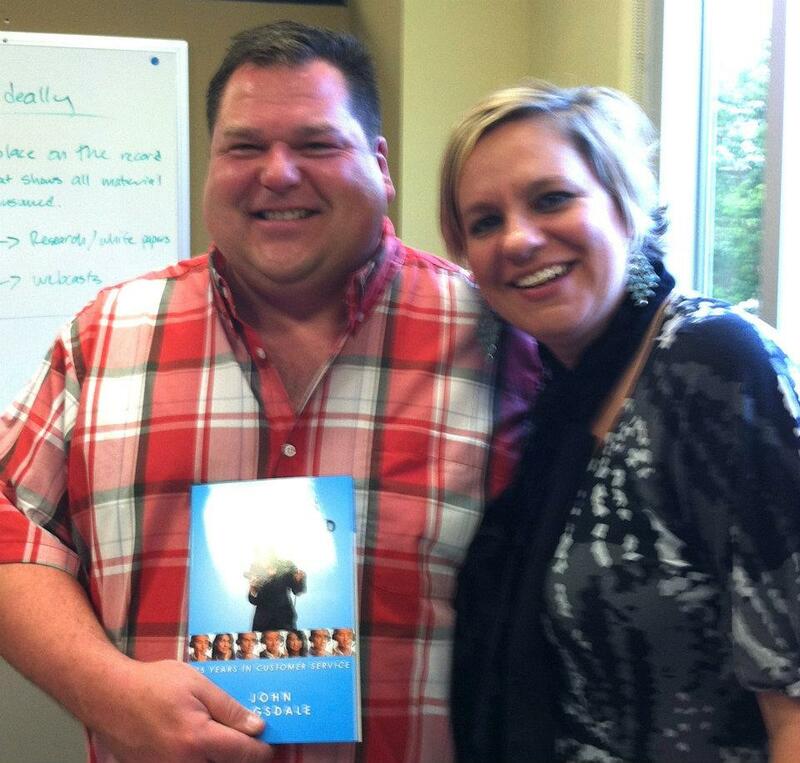 John Ragsdale and Cindy McComb, TSIA's Sr. Director of Marketing, open the first box of Lessons Ulearned. Lessons Unlearned follows my career from my early days at JCPenney, through my years working for Silicon Valley CRM and KM vendors, to the last decade-plus as a technology analyst. The book documents the lessons I learned along the way, and hopefully these lessons will save some of you from having to make all the mistakes I made trying to figure everything out! My intent was to make the book broad enough to appeal to an audience larger than just customer support techs and managers. For consumers, i.e., the general public, understanding how customer service operates and the metrics service operations use to determine success can help you understand how to resolve issues in your favor. I have a section on what customers should do when they encounter poor service, and clearly that’s advice every one of us can use. For customer support, I’m hoping the first 3 chapters of the book can serve as a new employee manual, and/or a guide for new support supervisors or managers. These chapters outline all the key metrics used in support, and how to balance cost, quality and operational metrics. I also have chapters on stewardship towards customers, and common employee types and how to manage and motivate each type (something I seriously wish I had understood in my early days of management). For technology buyers, I have chapters on how to select technology–without using an RFP–and the importance of process over technology when it comes to project success. I include 2 examples of companies (names removed to protect the guilty, of course) I’ve done projects with whose processes were so broken you will shake your head in disbelief. For technology vendors, I do a deep dive on working with industry analysts, including how to get the briefing, how to structure the briefing, and an inside look at how analysts operate. I include a very frank discussion about the reality of “pay for play” in the analyst world, and I even have some fun lists of pet peeves from analysts about vendors, and pet peeves from vendors about analysts. For knowledge workers, I have a chapter on the importance of knowledge management (including a TSIA member case study), and discuss the reasons why knowledge management projects fail, and how to prevent becoming a failure statistic. In addition to this, you will find lots of personal stories and behind-the-scenes gossip from Silicon Valley. While I hope to educate consumers about customer support, and help service organizations increase service levels, I also want to entertain the readers of Lessons Unlearned, so hopefully there are plenty of things to give you a chuckle along the way. I hope to see all of you at the Santa Clara Convention Center May 7-9 for TSW. All attendees will receive a copy of the book–they will be available at all the partner booths in the Expo. I’ll be on the Solutions Stage during Expo hours Monday and Tuesday evening to answer questions and sign your copies of Lessons Unlearned. Hope to see you there! Education: 71% of education services teams are using communities to share tips and tricks for education customers, FAQs from students, strategies to improve learning comprehension, etc. Professional Services: 63% of professional services teams are using communities to share custom code created for application customizations and integrations, lessons learned on customer projects, etc. Field Service: 74% of field service teams are using communities to share information on how to repair unusual problems, or older versions of equipment, sharing other insights gleaned from customer appointments, etc. Regardless where you are in your community journey, join us Thursday to learn more about enterprise collaboration and creating more customer-centric organizations. If you don’t have time to attend Thursday’s webcast, register anyway! We’ll send you a link to watch a recorded version of the webcast at your leisure, as well as a copy of all the slides from the webcast. This Thursday I am moderating a webcast on the ROI of KM, “The ROI of Knowledge: It’s Not What You Expect (It’s Much More! ),” based on a white paper I am co-authoring with Consona Corporation. In the paper, I use TSIA industry benchmarks for average metrics, as well as actual business results TSIA members have received from knowledge management (KM) implementations, to construct some real-world ROI calculations to show why investments in KM pay off…and can pay off fast. There are lots of business impacts when you implement a new KM program, including talk time, first contact resolution rate, escalation rates, resolution times, and training time. This last area—reducing training time—was the first big impact of KM we felt during my time as a technical support manager at JCPenney. In fact, our amazing success with KM is what fueled my move to Silicon Valley in 1995 to work for the first KM startup building tools for support. I’ll share an anecdote with you that was cut from my upcoming book, Lessons Unlearned. All JCPenney stores must go through a physical inventory process each year, and it is a nightmare for the stores and the Store Systems Hotline, the group which supports all the point of sale (POS) equipment and application used in JCPenney retail stores. Every JCP store in the world does inventory over the same three day period, and some stores are closed for the process. It is a huge effort: All merchandise must be physically counted, with tallies for each item entered into an accounting system. At the Store Systems Hotline, we picked a dedicated team to handle inventory questions, and put them through several days of training. Since store employees only used the inventory applications and the inventory merchandise scanners once a year, there were always lots of questions, huge volumes of calls, and big backlogs of time-sensitive inventory-related incidents. The first year that we implemented a knowledgebase, we took great care in documenting knowledgebase articles for every inventory question we received. It was a lot of work, but when inventory rolled around the next year, we were ready. Instead of pulling a big group of senior techs off the phone for inventory the second year, we brought in a group of temps. Instead of training them on the intricacies of the accounting and inventory applications, we taught them how to search the KB. And it worked. These untrained temp agents handled over half of all incoming inventory questions using the knowledgebase, and if the issue was too complex, we had a few seasoned experts available to take over the call. But having that documented library of question/answer scenarios was so powerful that unskilled agents were handling questions like seasoned professionals. That is the power of the knowledgebase. 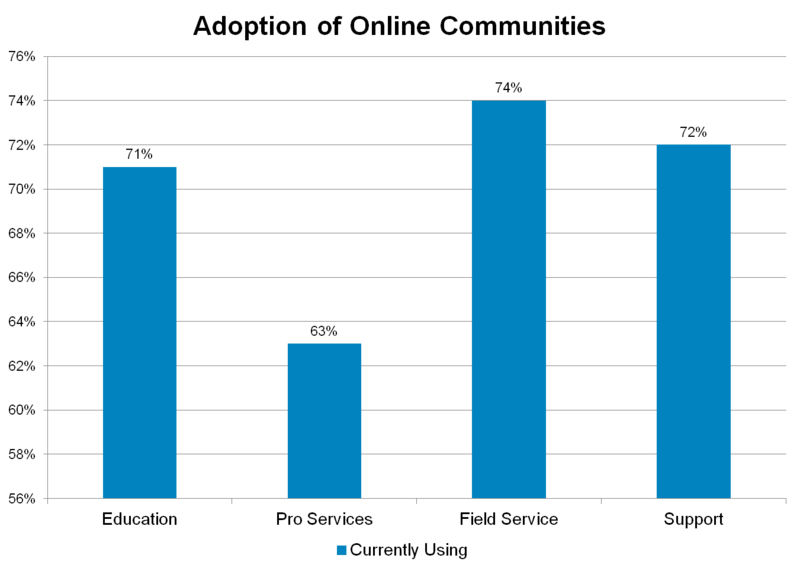 In the webcast, I will reveal the KM spending numbers for 2012-2013 (spoiler alert: the numbers are huge–the largest I’ve seen for KM since becoming an analyst), and walk through the metrics needed and how to calculate three key savings from KM: reduced resolution time, reduced escalations, and increased adoption of self-service (deflection). These aren’t trumped up numbers either, these are actual savings TSIA members are receiving, as documented in dozens of STAR Award applications for Best Knowledge Management Practices and Best Online Support. I will also explain the correlation between improving KM practices and rising CSAT and loyalty scores. And, all attendees will receive a complimentary copy of my research report, “Calculating Business Benefits of Knowledge Management: Metric Improvements and Cost Savings Using Real-World Data and Examples,” to be published May 1st. Please go ahead and register for the webcast, even if your calendar is full on Thursday. We’ll send you a link to listen to webcast recording, as well as all the webcast slides. And, you will automatically be sent a copy of the ROI report for registering! Thanks for reading, and hope to see you online Thursday! I’m very pleased to bring you an interview with one of the professional development course instructors, longtime TSIA partner, Francoise Tourniaire, founder of FT Works. John Ragsdale: Thanks for agreeing to share your wisdom and expertise with TSIA members at your upcoming professional development course at the opening of our Technology Services World conference. Can you give my readers an overview of the course? Francoise Tourniaire: Winning Support Websites is focused on taking existing support websites from whatever their existing states may be to GREAT! It’s targeted towards the many support executives and managers who feel that their websites are not that great but don’t quite know what to do about it. Francoise: We are going to work hard, and by that I mean all the attendees will work hard! I will ask all the attendees to bring screenshots of their current sites and their top 3 design concerns, and we will work together on solutions and improvements. I will introduce a set of best practices but most of the time will be spent doing real-time consultations on websites. We will also cover the process for redesigning websites so that the participants know what to ask and what to watch out for once they decide to embark on a redesign initiative. Francoise: One of the big themes of Winning Support Websites is that a great support website should not be siloed. We tend to think of ourselves as support people, or professional services people, or educational services people, but customers don’t care about how we organize internally: they need help to use the products more successfully and they expect to find everything they need in one place. So I advocate a unified approach to support websites, one that gives customers full access to all the various services that the company offers. John: What are some of the common challenges you run into when working with companies on support websites? Do you see companies struggling with similar problems? Francoise: Each client is different, naturally, but the big themes tend to be the same: (1) there’s no solid analysis of what customers are looking for on the site so it’s not clear what they should do when they visit, (2) navigation is challenging and (3) the site looks like it’s ten years old, and not in an attractive, vintage way. Also, companies often focus too much on functionality: do we have a community? Do we have a knowledge base? And not enough on how users interact with the website. It’s great to have a community, say, but if it’s hard to find, or disconnected from the other troubleshooting options it’s not to useful. So you need a vision for what customers want to accomplish on the site, not just a checklist of features. John: What are some of the key trends you see making support websites a critical topic for service professionals? Why should companies focus more on this area? Francoise: Support websites are a critical component of success for self-service, naturally, but also for peer-to-peer support and assisted support. So investing in a great website brings dividends for customer satisfaction and cost – a great double win. And since most support websites are not so great, the opportunity to improve is very large. John: Francoise, thank you so much for taking the time to speak with me today, and good luck on your professional development course! Francoise: My pleasure John. See you at TSW! The mobile revolution. When I first started research on this topic 3 years ago, I have to admit I was a bit jaded. During my time in product marketing at Clarify, one of the original CRM vendors, I owned the mobile application we were developing back in 1999-2000. The WAP interface was awful, and it was no surprise that although all the big CRM vendors spent millions of dollars developing mobile WAP applications, no one adopted them. This time around, things are different. A number of market forces have combined to make this foray into mobility for the enterprise a big success, and I’ll talk about the drivers of the mobile revolution, some very cool technologies available, and how service mobility projects are delivering ROI to the enterprise. The video revolution. I published an article 2 years ago about how Adobe was incorporating videos into knowledgebase articles and saw self-service success climb as a result. The more I dug into video, the more exciting use cases for service I found, from on-site real-time training for field techs, to distance learning for education services, to face-to-face collaborative sessions for support. We are also seeing innovative firms like HP Consumer building dedicated YouTube sites with video tutorials–definitely a best practice for 2012 and beyond. Social collaboration. Personally, I’m a bit weary of discussing customer communities and social media, since I first wrote about in 2005. But there is a new twist on social collaboration this year, and that is a focus on employee collaboration. This includes building communities for employees–which are proving successful for early adopters in field service and professional services–as well as incorporating Twitter-like employee communication tools, like Salesforce Chatter. And, we are seeing companies moving toward blending customer, partner and employee communities to truly leverage expertise across the enterprise. Also on tomorrow’s webcast, we will hold a drawing for 2 pre-release copies of my book, Lessons Unlearned, which officially launches next month. Only live attendees are eligible for the drawing, so register now! See you tomorrow! You are currently browsing the Ragsdale’s Eye on Service weblog archives for April 2012.